For the first time in history the texts and images of all the Dead Sea Scrolls are available in their totality on the Internet. The publication of the scrolls has been completed in 2009, and research is being conducted in the whole world on the basis of the official paper editions. However, at the same time there is an ever growing need to make these editions available on the internet, and Brill has now succeeded in making these available online. Based on the Dead Sea Scrolls Electronic Library CD-ROM, published by Brill and Brigham Young University, Brill proudly announces an internet edition whereby the biblical texts have been made available in 2015 and the non-biblical texts are available as of the 1st of April 2016. Both databases present a complete Hebrew transcription and English translation of the Biblical text and the Non-Biblical text, together with high-resolution images and can now be used side by side covering all the DSS texts ever published before. 1Q30 = 1QLiturgical Text A? 1Q31 = 1QLiturgical Text B? 4Q249j = 4Qpap cryptA Levh? 4Q249n = 4Qpap cryptA Liturgical Work E? 4Q249o = 4Qpap cryptA Liturgical Work F? 4Q249p = 4Qpap cryptA Prophecy? 4Q250a = 4Qpap cryptA Text Concerning Cultic Service B? 4Q322a = 4QHistorical Text H? 4Q324b = 4QpapCal. Doc. A? 4Q324f = 4QcryptA Lit. Cal.c? 4Q324g = 4QcryptA Cal. Doc. F? 4Q324h = 4QcryptA Cal. Doc. G? 4Q337 = 4QCal. Doc. E? 4Q348 = 4QDeed B heb? 4Q382 = 4Qpap paraKings et al. 4Q384 = 4Qpap apocrJer B? 4Q385c = 4QpsEzek: Unid. Frags. 4Q418b = 4QText with Quotation from Psalm 107? 4Q465 = 4QpapText Mentioning Samson? 4Q468g = 4QEschatological Work A? 4Q468k = 4QHymnic Text B? 4Q483 = 4QpapGeno or papJubj? 4Q527 = 4QLiturgical Work D? 6Q27 = 6QpapCursive Unclassified Frgs. 6Q28 = 6QpapCursive Unclassified Frgs. 6Q29 = 6QpapCursive Unclassified Frgs. 6Q30 = 6QpapCursive Unclassified Frgs. The contents of this online publication is identical to that of The Dead Sea Scrolls Electronic Library, Brigham Young University, Revised Edition 2006, part of the Dead Sea Scrolls Electronic Reference Library of E.J. Brill Publishers (Leiden: Brill, 2006). Its interface is different. The contents are described in the Introduction. The interface of Dead Sea Scrolls Electronic Library Non-Biblical Texts Online is different from the CD-ROM because it is adapted to our website, BrillOnline Reference Works. The publication is divided into texts. The texts consist of transcriptions by various editors (see the Introduction) and their translations accompanied by images (photographs), allowing for. comparison with the diplomatic edition of the Hebrew or Aramaic text. The texts are arranged by columns or fragments. The images (photographs) accompanying the transcriptions derive mostly from the collection of the Palestine Antiquities Museum (PAM), now housed in the Israel Antiquities Authority. Some images come from the collection of the Israel Antiquities Authority. Many plates contain several images, all well indicated, and the user always has to identify first the fragment in which one is interested. Often more than one image is provided, starting with the last series of PAM photographs (43 or 44 series), followed by the earlier series (42, 41, 40). Practical advice. Click on a photograph to expand it in a window on the current page; then right-click and select "Open image in new tab" (or similar wordings) to open the photograph at maximum size in a new tab. By fragging the tab from its position, it becomes a separate window. That window can be positioned next to the transcription and translation of the text in your current window, enabling side-by-side comparison. (Now close the enlarged image in your original window by clicking on it). Philologically certain text is presented in black; reconstructed text is an in orange/brown colour. Reconstructed text is placed between square brackets. For details, see the Introduction, I. Usually the space between stretches of preserved letters within the line in the Hebrew text is indicated precisely. In other words, the reconstructed text would fit exactly in the indicated space. However, in some instances the spacing is imprecise, especially when much text is lacking. This situation will be improved in a subsequent release of the database. Previous editions of this publication relied on a visual means for indicating parallel texts. This system, using overbars and underlines, was developed fully in the volumes published in the 1990s. It is based on examination of the exact amount of overlap as recorded in the DJD editions. 16 It records very precisely all the letters and spaces that any two texts have in common, so that even the smallest agreements and differences between them are visible whether underlined or not. In several cases, three or four different parallels are indicated by three types of underlining as well as overbars, such as in the manuscripts of the Damascus Document (4Q266–273 [DJD XVIII]). Unfortunately, our website does not support this visual system. Brill is therefore developing an alternative. Meanwhile, all information pertaining to parallel texts can be found in the metadata of each fragment or column. This system ensures that no information is lost. Thanks to the web interface of this publication, users can position parallel texts side by side in two different windowns and compare them line by line. Probable and possible characters are indicated in the Dead Sea Scrolls transcription with dot above and circle above respectively. This applies also to Aramaic numerals in the Hebrew text. However, the font that is used for rendering Aramaic numerals does not support these combining characters. As a result, the dot above and circle above may be displayed beside the character instead of over it, or they can be displayed as a square. This differs per browser. For example, 4Q320 Frg. 4 Col. v, contains in line 2 a character which probably is the Imperial Aramaic number one. In most browsers, the dot above is displayed to the top left of the numeral instead of over it. Browsers have problems combining characters from different fonts. For that reason, Brill is working on an extension of the Imperial Aramaic and Phoenician fonts we are using at the moment. Once that is implemented, such combining characters should display correctly across all browsers. We expect this to happen in June 2016. Users of Dead Sea Scrolls Electronic Library Non-Biblical Texts Online can navigate from one entry to the next (or the previous) by clicking on the navigation arrows at the top and bottom of every entry. The upward arrow leads to the list of entries. This is the list of Dead Sea Scrolls Non-Biblical Texts ordered by inventory number. This list can be found under the tab Texts acc. to inv. number on the home page of this publication, which is where you are now. 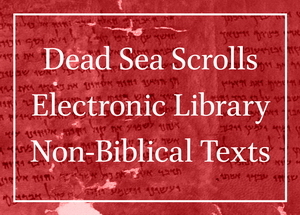 There is also a list of Dead Sea Scrolls Non-Biblical Texts ordered by descriptive name. It can be found under the tab Texts acc. to name, to the right of the tab mentioned above. There are two other tabs on the homepage. One contains links to, among others, the scholarly introduction to Dead Sea Scrolls Electronic Library Non-Biblical Texts, the Contents of The Dead Sea Scrolls Reader (ed. D. W. Parry and E. Tov, Leiden/Boston, 2004-2005), and the Inventory of the Qumran Texts (E. Tov with the collaboration of S. J. Pfann, a revised version (2005) of the original publication in DJD 39 (2002) 27–114). The other tab is the 'About this publication' you are reading right now. At the top of every page on BrillOnline Reference Works, there is a search field. This searches both content (full text) and metadata. In this way one can search for a specific Qumran text. Note that Dead Sea Scrolls Electronic Library Non-Biblical Texts is also available from Brigham Young University. Not in the form of a CD-ROM, but as a set of electronic books which can be read and linguistically analyzed through the WordCruncher software. Please contact Brigham Young to download the software and the books.